You'll be £12.00 closer to your next £10.00 credit when you purchase From Imperial Splendour to Internment. What's this? This important new work describes how the Imperial German Navy, which had expanded to become one of the great maritime forces in the world, second only to the Royal Navy, proved, with the exception of its submarines, to be largely ineffective throughout the years of conflict. The impact of this impotence had a far-reaching effect upon the service. Germany, indeed most of Europe, was in the grips of a spirit of militant nationalistic fervour, and the inactivity of the great Imperial Navy caused deep frustration, particularly among the naval officers. Not only were they unable to see themselves as heroes, they were also ridiculed on the home front and felt profoundly humiliated. With the exception of the one sea battle at Jutland, their ships saw little or no action at sea and morale slowly collapsed to a point where, at the end of the war, the crews were in a state of mutiny. The seemingly ludicrous order that forced the fleet to go to sea against the British in 1918 was driven by a sense of humiliation, but coming at the war's end it triggered a revolution because the German sailors wanted no part in such madness. The internment at Scapa Flow was the ultimate shaming. This is a fascinating and perceptive analysis of a whole era, and it contributes substantially to our understanding of the war and its consequences – consequences, sadly, that helped pave the way for the Third Reich. Minor niggles in what is otherwise an excellent account of what made the High Seas Fleet ‘tick’. This is a most welome book. The highlight of this book is Wolz's dramatic recounting of Rear Admiral Ludwig Reuter's scuttling on the interned High Sea Fleet as Scapa Flow on 21 June 1919. It is written in a lively, personal style and spares no reputations. This well written, authoritative work describes how the Imperial German Navy, which had expanded to become second only to the Royal Navy, proved, with the exception of its submarines, to be largely ineffectual during the war. With the exception of one battle, Jutland, the High Seas Fleet saw little or no action at sea and by the end of the war the crews were in a state of mutiny. A fascinating book and well worth reading. This important new work describes how the Imperial German Navy, which had expanded to become one of the great maritime forces in the world, proved, with the exception of its submarines, to be largely ineffective throughout the years of conflict. The reasons for the German Navy's demise is well known. However, this is an important new view of the war at sea from a social history and political viewpoint. 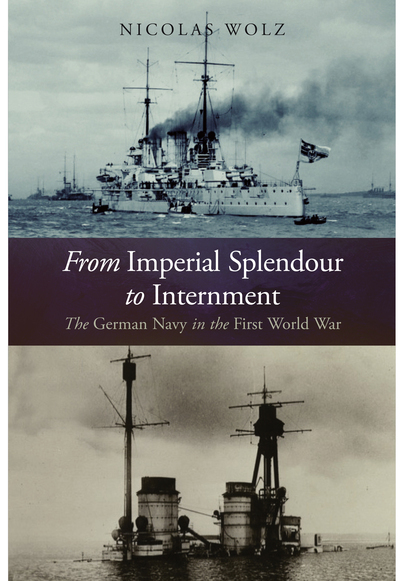 The author's German nationality adds a high level of credence to this very thoughtful work... From Imperial Splendour to Internment is a fine book worthy of consideration by all students of naval history. A well-written and informative examination of the Imperial German Navy, from its birthrights after the War of 1879 until its demise, culminating with the entire High Seas fleet of seventy-four ships lying at the bottom of Scapa Flow during the internment following the signing of the Treaty of Versailles. This book allows us a fascinating insight into the hearts and minds of German and British sailors who lived through the experience of being at sea during the First World War. I highly recommend this book to anyone interested in the Imperial German High Seas fleet or the naval history of WWI.